To reduce the risk of a devastating stroke, each year as many as 100,000 people in the U.S. — and many more worldwide — with narrowing in a carotid artery undergo preventive treatment. 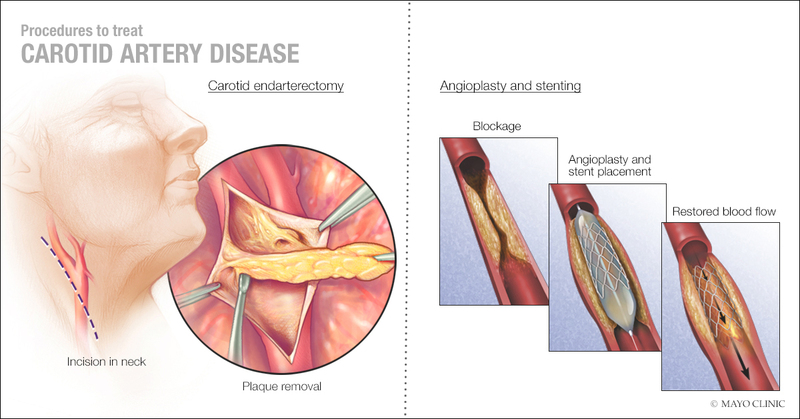 One procedure, known as carotid endarterectomy, is a surgical operation to remove built-up plaque in the artery of the neck. A less invasive approach, introduced in the 1990s, is carotid artery stenting, which involves the insertion of a wire mesh that widens the artery to improve blood flow. That’s important, he adds, because the typical patient with a narrowed carotid artery is 70 years old. Life expectancy is another 16 years for women and another 14 years for men. The study followed 4,754 patients in 19 countries. Those patients, who were participants of previous studies comparing the two procedures, had been assigned randomly to undergo endarterectomy or stenting. One of those studies was the Carotid Revascularization Endarterectomy vs. Stenting Trial (CREST), led by Mayo Clinic. Another was the International Carotid Stenting Study, led by University College London. “These trials had similar designs, which allowed us to combine the data with two other trials from France and Germany, to answer important questions concerning stroke treatment,” says Dr. Martin Brown from University College London in England, neurologist and corresponding author of the Lancet Neurology paper. The research team followed patients’ outcomes for up to 10 years after the procedures and found the long-term rate of stroke following either procedure was as low as 0.6 percent per year. “Very low rates of stroke held up whether patients were male or female, old or young, smokers or nonsmokers,” notes Dr. Brott. The team also compared the incidence of stroke in the immediate days and months after treatment, a period of time when patients are at risk of a poor result due to the risks of surgery or stenting. The researchers found endarterectomy to have better post-procedure results. However, Dr. Brott notes that several factors, including stenting technology and proper patient selection, have continued to improve over the years since patients in the current study had their procedures. He anticipates short-term outcomes of stenting could soon match those of surgery. “Our studies have found patients over 70 and those with very hardened or very tortuous arteries tend to do better with surgery than with stenting,” he says. “There’s better information available now to match the right treatment to each patient.” Dr. Brott has been honored three times with awards by the American Heart Association, most recently the 2017 Research Achievement Award, for his research and work in revolutionizing treatment of ischemic stroke.